As we grow older and age gradually, our nails tends to alter and take a new look. 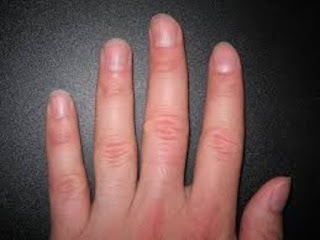 Most people that have approached 60 years and above, discover that their nails become brittle and prone to yellowing. Just like our bones can weaken and become more susceptible to breakage, so can our nails. Unfortunately, our nails are on display for everyone to see and for many it can become a embarrassing. Most people do not realise just how important the cuticles are when it comes to keeping your nails and hands healthy. The skin on your cuticles actually creates a barrier to stop bacteria building up where your nail and skin meet. Manicurists will often trim the cuticles to make your nails appear neater, but this is the opposite of what you want. To avoid infection and keep the area healthy, rub a little olive, almond or coconut oil onto your cuticles before getting a manicure. It will soak into the skin and stop any harmful chemicals from the polish seeping into the area. While it’s always nice to have freshly painted nails, the potent chemicals found in nail polish remover and varnish can strip away the healthy oils in your nails over time and leave them dry, brittle and flakey. While there is absolutely nothing wrong with getting a manicure or pedicure, give you nails a break every couple of months and go for a simple file and buff instead. Rub coconut or olive oil into them every night before bed to keep them shiny and smooth; you can even rub the oil up over your hands for some deep moisturizing action while you sleep. If your nails are in need of some serious TLC, try a home remedy that will strengthen and protect them from further damage. Mix and keep in a sealed bottle. Rub a small amount onto your nails. Leave for 3 to 5 minutes. Wipe off. Makes enough for 20 to 30 applications. If you are filing your nails at home, make sure you file from the outside edge of the nail inwards. Some people file back and forth across the whole nail, which can cause breakage and splitting. Aside from treating your nails on the outside, there are plenty of ways you can improve things by making a couple a easy changes to your diet. Be conscious of the vitamins you are eating and aim for plenty of vitamin B, zinc, iron, calcium and vitamin Z and C. Vitamin B will strengthen and protect, while zinc helps remove those pesky white spots. Iron will help curb ridges appearing on the tops of your nails, while calcium will keep your bones and nails strong. Vitamin C and Z both prevent drying skin and nails.